Time flies when you're busy! Between filling orders, re-decorating the house and life in general, there just isn't enough time in the day. So I must apologize for the lag between studio postings on the blog. I have been able to get a few new jewelry pieces posted on the website. The first of the new fall jewelry pieces is the Autumn Splendor Czech Leaf Charm Cuff Beaded Bracelet (B121) which is back in stock, but there is only one (1) available. The other one is the Autumn Harvest Leaf Charm Topaz Crystal Beaded Bracelet (B164). 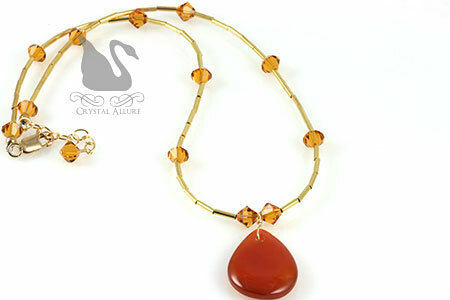 The latter beaded bracelet pairs perfectly with the Autumn Honey Topaz Carnelian Gemstone Beaded Necklace (N039), listed below. I hope everyone had a fabulous holiday weekend. I spent four days painting. Yes, painting. I had a whole list of things I wanted to accomplish and it just didn't happen. We have a 'small-ish' room that is essentially shaded by the roof of our wrap around porch. Well, a fews years after purchasing our house, I had a wonderful idea to paint the room brown. I really wanted a chocolate color, but got walnut. On top of it, with the existing walnut trim, well....it didn't look so great! But years passed and I tried to work with it but just finally decided to dive in and paint. Not that I don't love to paint -okay I don't love to paint -I just love the look after it's all done! The room is now a beautiful warm, muted shade of yellow/mustard yellow. Brightens the whole room! So, after two coats of primer and two coats of paint -many sore muscles -I never got around to getting pictures of the new jewelry yet to be posted on the website. But, it's coming, I promise. Before the holiday weekend started I did get a chance to set two lovely beaded necklaces, perfect complements for your autumn wardrobe, as FEATURED pieces. The best part is that you can save up to 20% on each necklace until September 22, 2009! Each necklace is a one-of-a-kind. 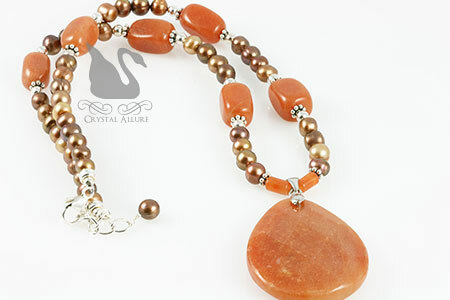 You will find all featured and highlighted jewelry pieces on the Crystal Allure website. Pssst -Stay tuned for an upcoming Fall Jewelry and Colors Trend Report!